Welcome to the new Cultural History of Philosophy blog at Queen Mary University of London. The main aim of this blog – and of the QMUL undergraduate module it accompanies – is to take a fresh approach to the history of philosophy, by exploring the ways that philosophers and philosophies have shaped public life, popular culture, and personal identity – sometimes in unnoticed and unconscious ways. This will be a kind of history that approaches philosophical texts and ideas from the outside in – starting with perspectives from social and cultural history rather than within the pages of canonical works of philosophy. Sometimes the history of philosophy has been taught as a branch of philosophy. Here it will be treated as a branch of history. The two images below of the English philosophical writer Colin Wilson capture visually some of the issues I hope this blog and the module it accompanies will explore. Wilson’s 1956 book The Outsider, brought existentialist ideas to the British public in a newly fashionable form, and catapulted Wilson to overnight celebrity status. You can read more about Wilson, who died in 2013, in an obituary in the Telegraph, in an essay for Aeon magazine by Ken MacLeod, and in a blog post by Rob Baker – which are also the sources for the photographs below. The first photograph below shows the philosopher in a cluttered domestic setting, with a mug, leftover breakfast things, and an empty bottle hinting at the hedonism of the night before. This is a kitchen-sink existentialist for the era of the kitchen-sink drama. As so often, the figure of the philosopher here is a man. But what are we, as viewers of this studiedly bohemian scene, supposed to think about the woman reclining in the background (in fact Wilson’s girlfriend Joy)? Is she Wilson’ intellectual equal and partner in philosophical dialogue? Is she a pupil sitting at a philosophical master’s feet, or perhaps a budding Simone de Beauvoir in her own right? Or do the position and pose of the hazy feminine figure suggest a more sensual connection between the two? The second image of Wilson shows him alone on Hampstead Heath in his sleeping bag. Part of Wilson’s appeal as a philosophical persona was that he conformed to various established cultural types, including the working-class autodidact (he was the son of a Leicester factory-hand and left school at sixteen) and the romantic genius (Wilson was never shy about applying the term ‘genius’ to himself). 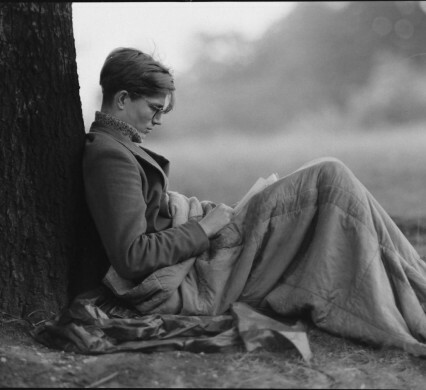 The publicity for The Outsider included the claim that Wilson had spent his days in the British Museum reading room, and his nights in a sleeping bag on Hampstead Heath while working on the book. Although the heath is an enclosed green area in an urban setting, the image is suggestive of another face of the philosopher – the romantic confronting and communing with nature – leaning against, if not hugging, a tree. The iconography surrounding Colin Wilson and The Outsider seem an appropriate starting point for a new exploration into the history of philosophy starting from the outside. Wilson’s class, lifestyle and appearance – including his trademark polo-neck, spectacles, and sandals – were as important as his ideas. Wilson remained an outsider to academic philosophy throughout his life, and soon became an outsider to the fashionable literary and intellectual worlds he had briefly entered too. His career offers some telling examples of the ways that philosophies and philosophers, both within and outside the academic discipline of philosophy, have shaped our cultural history – in modern Britain and more broadly. I hope that others interested in this subject – historians, philosophers, journalists, students, readers, thinkers, existentialists, autodidacts and romantic geniuses of all kinds – might also like to write for the Cultural History of Philosophy Blog. In future posts I will write a bit more about the kind of thing I’d like to see on the blog myself, but if you already know that you would like to propose a short research essay, book review, or anything else to be published here, then please do email me at t.m.dixon@qmul.ac.uk with your idea, or make contact via Twitter @ThomasDixon2015. This entry was posted in British Philosophers, Images of Philosophers, Philosophy and Literature and tagged angry young men, Colin Wilson, existentialism, kitchen sink drama, Philosophical Britain, The Outsider on December 17, 2014 by Thomas Dixon.